1. Put the berry mix, lemon zest, orange zest and juice, brandy, mixed spice and dark brown soft sugar into a small saucepan. Bring to the boil, then take off the heat. Stir in the apples and set aside to cool for 30 minutes. 2. Preheat the oven to 180°C, gas mark 4. Mix the breadcrumbs with the cinnamon, half the demerara sugar and 2 tbsp melted butter, then tip onto a large baking tray. Bake for 6-8 minutes until crisp. 3. Lay 2 sheets of pastry on a clean, damp tea towel. Brush with melted butter, then scatter with a quarter of the breadcrumb mixture. Cover with 2 more sheets of pastry and brush again with butter and scatter with breadcrumbs. Repeat until all the filo and crumbs are used up. 4. Leaving a 3cm border around the edge, spread the apple mixture over the pastry and scatter with the pecans and marzipan. Fold the two short ends over to stop the filling spilling out. 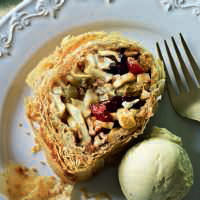 Then, using the tea towel, lift up one of the longer edges to start rolling up the strudel, as you would a swiss roll. Keep the roll tight and the edges tucked in. 5. Transfer to a baking sheet, brush all over with butter then scatter with the remaining demerara sugar. Bake for 35-40 minutes until golden. Serve warm or at room temperature with Waitrose Seriously Creamy Prune & Armagnac Ice Cream, if liked. This recipe was first published in December 2011.